Nowadays, e - ticket, you almost "survived" a classic paper. This is convenient because the electronic ticket can be purchased from the comfort of home, it is impossible to lose finally, it is not necessary to have with you at check – passport is sufficient that issued the ticket. However, going to travel, it makes sense to print and bring your e-ticket form, since it contains a lot of useful information. 1. The name of the passenger. 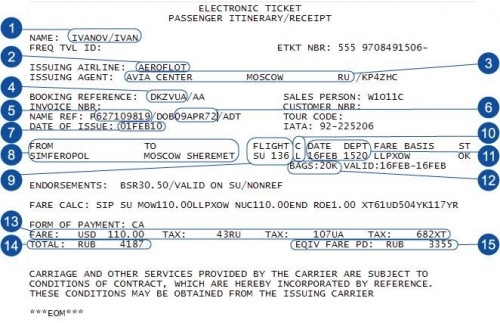 In this column specify the name of the passenger, who furnished the ticket. The name of the passenger indicated in the Latin alphabet, even if you are traveling to Russia. 2. The airline that issued the ticket. 3. The name and location (city name and code designation of the country), the Agency that wrote the ticket. If you bought a ticket directly from the airline, will be specified the name and location of the airline. 4. The reservation code, on the basis of which issues the ticket. Also near the reservation code or may be the number directly e-ticket. 5. Passport number of the passenger. Please note that not all airlines specify these data on the form of the electronic ticket. 6. Date of birth of the passenger. The same comment applies to this paragraph. 7. Date of ticket issuance. This information can be used elsewhere, for example, at the top of the e-ticket. 8. The departure city (FROM) and arrival city (TO). Next to the city name, typically the name of the airport terminal if the airport has several. 9. Flight number. Usually the flight number consists of the designator of the airline and numerical designation of a flight. 10. The booking class. Conventional code designation of classes of reservation are the following: F, P, a – first class; J, C, D, I, Z – business class; W, S, Y, B, H, K, L, M, N, Q, T, V, X for economy class. 11. Date and time of departure. Also here you can specify the date of arrival. Keep in mind that the time of departure and arrival on the ticket is always specified the local – it is necessary to know to inadvertently not miss your plane. 12. Norm of free baggage allowance. This information on the electronic ticket is specified not always, so it makes sense to check baggage free baggage allowance on the airline's website or through the call center of the airline. Please note that the allowance free baggage allowance for different airlines may vary. 13. A detailed calculation for the items which make up the cost of the ticket (FARE – rate, TAX – various fees: fuel, airport fees and so on). 14. The final cost of the ticket. This amount, as well as the figures in paragraph 13, stated in the currency in which calculated the cost of the ticket on the airline website. 15. The size of the tariff in rubles. 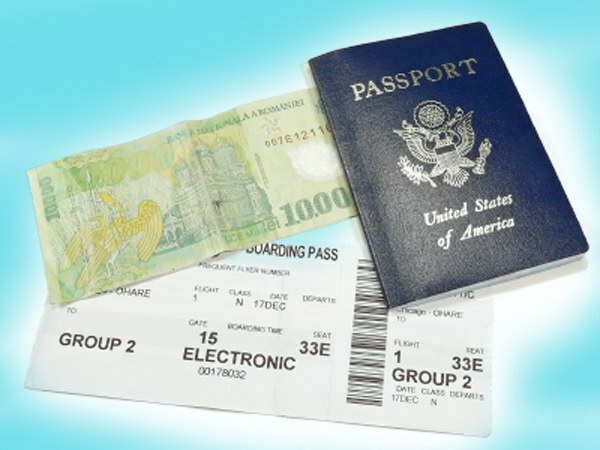 This item may not be present on all electronic tickets; in particular, if you bought your ticket from a foreign airline, its price in rubles, you will not be granted. Finally, under all these information points is a paragraph with notes, usually containing various kinds of warning, such as in the picture, warning that the baggage allowance of various airlines may be different.